In my late teens I worked as a sales assistant every Saturday in a department store in England called Lefevres. In school holidays I often worked full time, especially at Christmas when they needed extra staff. There were no automatic cash registers back then, so it was great for mental math skills. Over a period of 4 or 5 years I worked in almost every department in the store – from baby wear, women’s wear, underwear and hardware, to haberdashery, menswear and footwear. My hours were from 9am till 5.30pm with an hour off for lunch. I earned the princely sum of one pound a day. You could do a lot with a pound back then. If you’ve seen the BBC TV series “Are you Being Served?” which aired in the UK in the 1970s and 1980s you have an idea of what it was like. The place was full of bossy Mrs Slocombe-types, with a distinct hierarchy or pecking order. Everyone was referred to by their surname – first names were verboten. After a couple of years I was offered the job of Switchboard Operator because the girl who held that position during the week wanted Saturdays off. When things were quiet I used to ring a special number for the recipe of the day. This is one of those recipes and it remains a family favourite to this day. 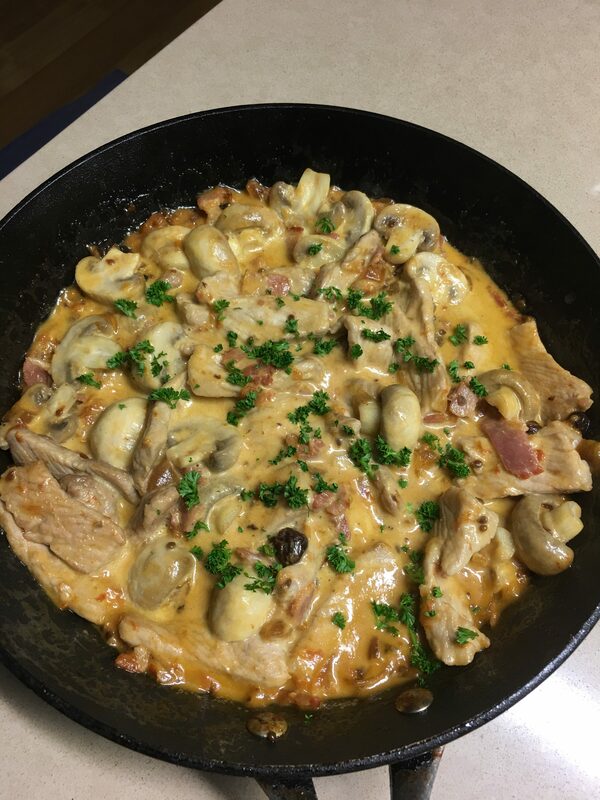 It’s a sort of pork stroganoff. If you don’t like pork use chicken thighs instead. By the way, in case you were wondering, the black bit at the bottom of the photo is a raisin from the chutney! Fry bacon in frying pan without fat, remove from pan. Add butter to pan and brown meat. Add mushrooms, bacon and chutney and cook, stirring for 3 mins. Add sour cream, the cooked bacon and check seasoning. Simmer for a few minutes until meat is tender – doesn’t take long. 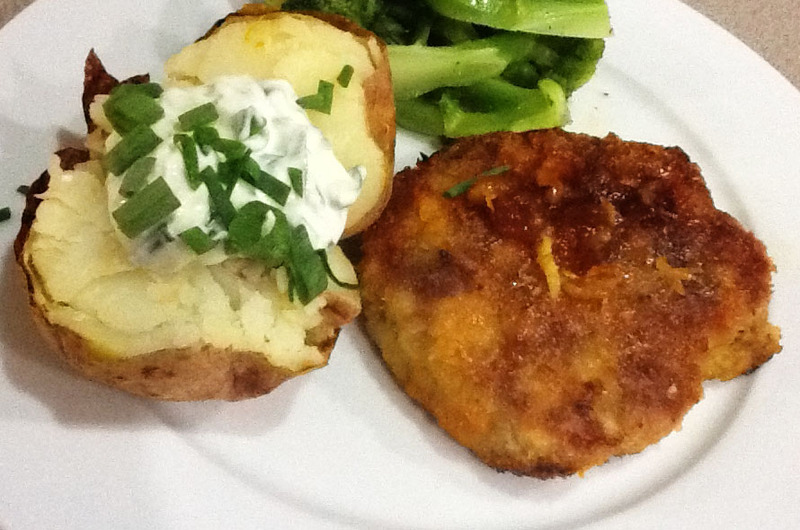 Garnish with parsley and serve with boiled rice and a green salad or green vegetable. Wraps have become a popular alternative to sandwiches in the past few years. Supermarkets and cafés offer a wide range and they make a satisfying and healthy lunch. Start by spreading the wrap with homemade or bought mayonnaise or hummus, then put some protein such as cheese, ham, cold roast chicken, canned tuna or hard-boiled egg in a line down the middle, then whatever else you can find in the fridge – chutney, olives, cucumber, grated carrot, sliced tomatoes, lettuce, a few nuts. I don’t think I’ve ever made the same one twice. This quick and tasty Chinese recipe uses lettuce cups instead of wraps and is perfect for a mid-week dinner or informal entertaining. Eat them with your fingers – which is a bit messy but the way they’re intended to be eaten – or with a knife and fork. Instead of lettuce cups you could serve the filling in ordinary bread wraps. In a large frying pan heat the oil then add the pork, onion and garlic and stir fry for about 10 minutes over moderately high heat, until onions are soft and pork is broken up and starting to brown. Add ginger and water chestnuts and continue to cook for a couple of minutes. Add remaining ingredients and stir until sauce has thickened and starting to caramelise. 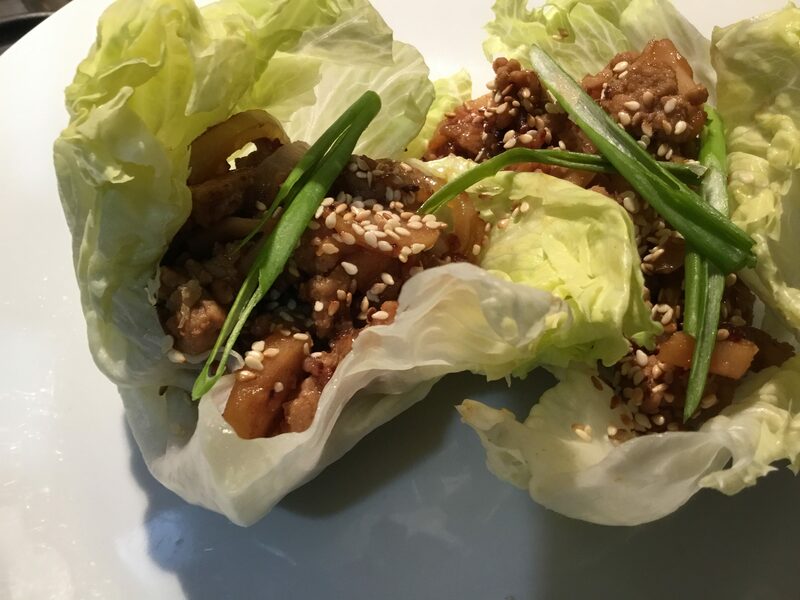 Serve pork in the lettuce cups garnished with toasted sesame seeds and spring onions. The outside leaves of the lettuce are too large to use for this recipe, so keep them for another meal and use the smaller ones. With a packet of mince in the freezer and some canned tomatoes and pasta in the pantry you can make any number of delicious meals without going shopping – spaghetti bolognese, lasagne, meatloaf or meatballs to name a few. Saw this recipe in an old Delicious magazine and got all nostalgic for a time when I used to make meatballs a lot, when we had kids at home. And it was indeed delicious. Mix all ingredients for meatballs and form into about 16 meatballs with wet hands. Place on a plate and chill for about 30 mins. Heat half the oil in a deep frying pan and cook half the meatballs on all sides or until they are nicely browned, then remove. Repeat with remaining meatballs. Tip off excess oil. Place stock in the pan with the canned and cherry tomatoes and simmer for a few mins. 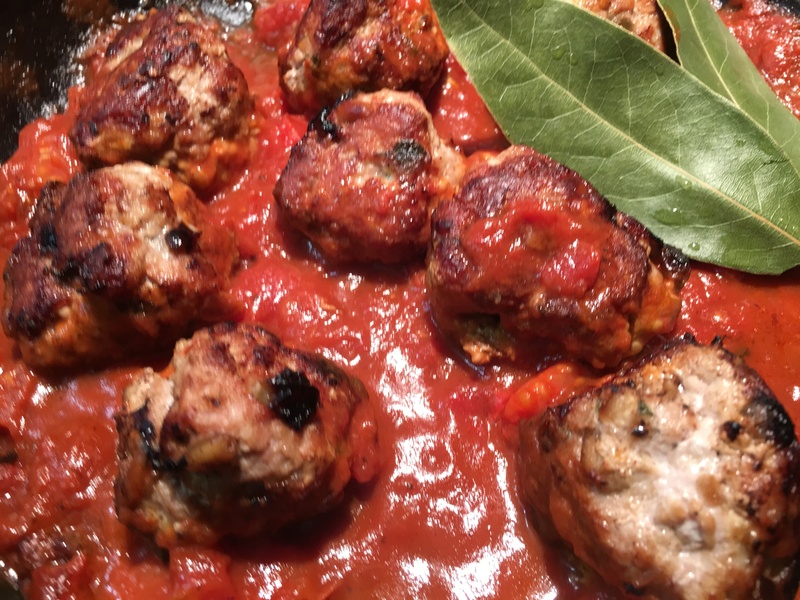 Return meatballs to pan with bay leaves, cover and cook for 20-25 mins or until meatballs are cooked through. From time to time spoon sauce over the meatballs and add a bit of water if it’s getting too thick. Stir in the lemon juice, top with extra parmesan and serve with a green vegetable and some pasta. Early in our marriage we were posted to Israel where we lived in the leafy suburb of Herzliyah Pituach, on the outskirts of Tel Aviv. It was one of the few times in our lives that we didn’t have a dog, but our neighbours had a boxer called Boris. They travelled a lot and Boris got lonely, so he spent as much time at our house as he did at theirs. When he felt the need for company he’d just turn up and we were always pleased to see him. Well, almost always. A Minister was visiting from Queensland with his wife and secretary, so we invited them to join us for a very informal barbecue lunch. Matthew headed off late Saturday morning to pick them up, wearing jeans and an open-neck shirt. Our guests arrived dressed to kill in white linen suits or similar attire. We sat in the garden sipping a glass of wine while Matthew lit the barbecue. Within five minutes Boris had arrived, his little stubby tail wagging excitedly as he sniffed the air in anticipation of things to come. He could smell a barbecue from a mile off. Boris was a friendly soul and his usual way of greeting new friends was to slobber his way along their knees. As Matthew tried to stop him and apologise Mrs Minister said through clenched teeth “It’s okay we don’t mind dogs.” Her face said differently as she studied the remains of Boris’s breakfast, now smeared all over her white pants. Matthew poured more wine, everyone relaxed and we moved to the table for lunch – barbecued lamb cutlets and salad, followed by apple strudel. Boris was starting to be a pain, snuffling under the table looking for scraps. Matthew escorted him home twice, but he kept coming back. We decided to give him a couple of chop bones at the far end of the garden, to keep him quiet. Suddenly the sound of Boris choking interrupted the conversation. Matthew leapt up, rolled up his sleeve and thrust his hand down the dog’s throat to retrieve the bone. Our guests looked on in horror. You will be relieved to know that Boris survived the ordeal and went on to attend many more barbecues, although bones were strictly off the menu. 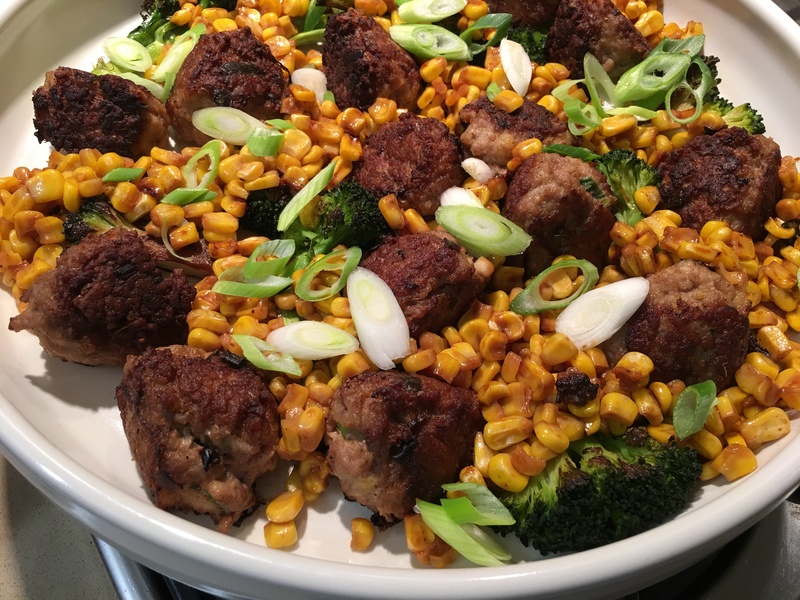 In honour of our dearly departed four-legged friend here’s a barbecue recipe without bones. It was given to me by an Australian friend in Israel and is very simple but always a winner. 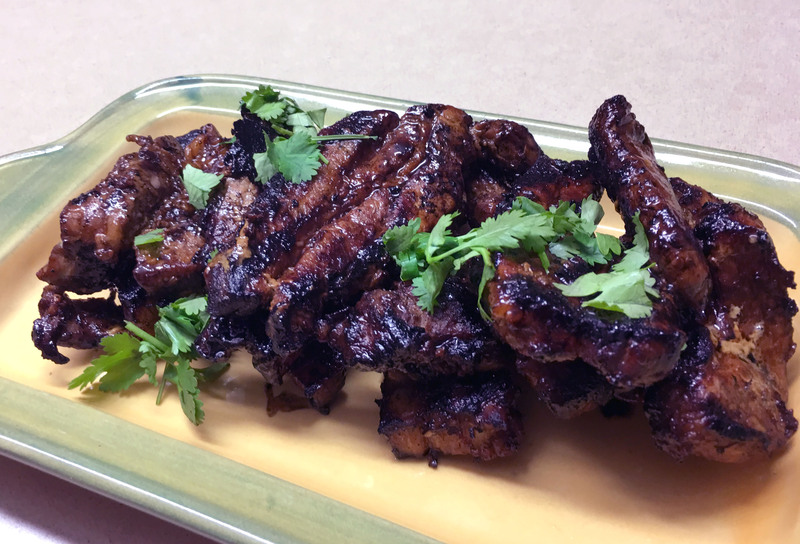 The quantities are flexible – if you use more pork just add more soy sauce, garlic and ginger! If the pork slices have skin, remove it. If they’re very thick slices hammer them out a bit with a meat hammer. Mix soy sauce, garlic and ginger in a shallow dish. Add the pork and turn to coat thoroughly. Leave to marinate for a couple of hours or overnight. Cook for about 15 minutes or so on a hot barbecue, turning a couple of times, or until well cooked and crispy. Roast Pork with apple sauce is a marriage made in heaven, but pork also goes well with other fruit. This mango salsa can be made in a jiffy and goes well with pork or chicken. If preferred just serve it with some grilled or pan-fried pork chops. Instead of mango try using fresh peaches or nectarines. I’m a bit old-fashioned when it comes to pork, because (unlike beef) I like it cooked until it’s no longer pink, as you can see in the photo. Cook potatoes in boiling salted water until almost cooked. Drain then place on a baking tray lined with foil. Spray or drizzle with olive oil on both sides, then squash them a bit with a potato masher. Season with salt and pepper. Preheat oven to 200°C. Heat butter in a frying pan with a metal handle that can go in the oven. Season pork all over then brown on all sides in the butter. Place potatoes in the top of the oven and 10 minutes later place the pork on the shelf below. Cook pork for 10-15 mins, by which time the potatoes should be nice and crispy. After ten minutes pork will still be a bit pink in the middle (except at the very thin end) whereas by 15 mins it should be more medium. Meanwhile cook the asparagus and make the Salsa. For the Salsa mix all ingredients in a small bowl. 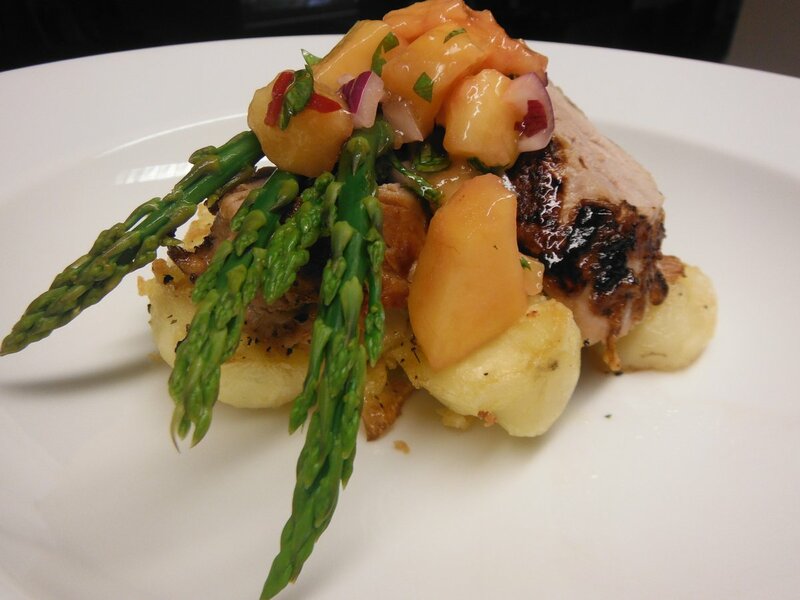 Slice pork and serve on a bed of crispy potatoes garnished with the asparagus and the salsa. Pork belly has become a regular addition to restaurant menus over the past couple of years. Its popularity is an indication that people aren’t so scared about eating a bit of fat every now and then, which is good. Succulent, juicy meat with a golden crispy skin, often served with creamy mashed potatoes, pumpkin or sweet potato and some wilted greens, with maybe a tangy sauce or glaze. Delicious. Getting the pork right takes time, so it’s not something you can whip up in the half hour before dinner. Fortunately most of the work can be done in advance, which is how they achieve perfect results every time you order pork belly in a good restaurant. With this recipe you can do the same. Start the recipe in the morning or even the night before. I use my coffee grinder to grind up the spices. Son James, a serious coffee drinker, says this is sacrilege. But I do give it a good wipe out afterwards and it makes the next brew of coffee interesting! Place pork in a shallow dish. Grind thyme and spices in a spice or coffee grinder, or use a mortar and pestle. Mix with salt, garlic and pepper. Rub half over one side of pork, then turn it over and rub the rest into the other side. Refrigerate for 4 hours or overnight, turning from time to time. Preheat oven to 150ºC. Rinse pork under cold water and pat dry with paper towels. Place skin side up on a rack in a roasting pan. Add enough boiling water to come 2-3 cm up the sides of the pan, but it shouldn’t touch the meat. Cover with foil and roast for 4 hours. Check from time to time to see if water needs topping up. Remove pork from oven and cool. Strain pan juices, place in the fridge and when cold remove and discard the fat from the top. A spoonful of this fat mixed into our dog’s biscuits and he’s in heaven! Use a very sharp knife to cut pork into six neat rectangular servings – you might even get eight, depending on the size you want. Recipe can be prepared ahead to this stage. About an hour before dinner preheat oven to 200ºC. Place oil in a cold frying pan large enough to take all the pork pieces and swirl to cover the bottom. Choose a pan with a handle which can go in the oven. Rub pork skin with a little salt then arrange the pieces on top of the oil, skin side down. Turn on heat and cook for 15 minutes on medium, or until skin is golden and crunchy. Turn pork over so it’s skin side up and place in the oven for 15-20 minutes to brown the bottom of the meat and heat through. Meanwhile boil the pumpkin, or potatoes or sweet potatoes and mash them with lots of butter, salt and pepper and maybe a dash of cream. Cook spinach or kale in a little butter until wilted, then season, or roast – see below. Remove pork from the oven. Place pork pieces on a plate and keep warm while you make the sauce. Tip off all the fat from the pan. Add reserved pan juices, honey and lemon juice and cook over high heat, stirring, for a couple of minutes, until slightly thickened. 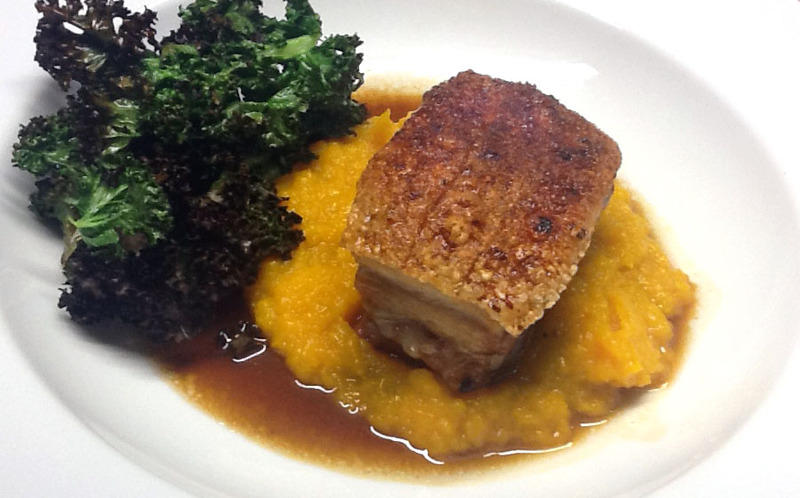 Serve pork on a bed of mashed pumpkin (potatoes or sweet potatoes) with some greens on the side. Drizzle the sauce over and around the pork. If liked serve with apple sauce on the side – see below. For a low carb version just skip the mashed potatoes or pumpkin and serve with more kale or some spinach or other green vegetable. Roast Kale: An unusual way to cook kale is to roast it. Break off pieces of kale 3-4 cm long and arrange on a baking tray lined with foil. Spray with oil, sprinkle lightly with salt, then place in a hot oven (with the pork) for 5-8 minutes or until turning a bit brown and crispy on the edges. Watch carefully as it burns quickly. Apple Sauce: peel, core and slice two large Granny Smith apples or cooking apples. Place in a small pan with half a cup of water and 2 Tbs sugar and simmer until soft. Use a potato masher to crush the apples into a chunky sauce and serve at room temperature. What the supermarkets here call pork spareribs are actually pork belly rashers, as they have no bones. I bought a packet and was planning to cook them with a sticky sauce. Then my Thai friend Pom gave me some plums, so I decided to throw them in towards the end of the cooking time. The result was delicious with the fruit providing just the right contrast to the richness of the meat. Preheat oven to 180°C. If liked remove rind from the pork. Leaving it on results in chewier pork, but I like it that way. Place pork in a baking pan and season on both sides. Bake for an hour to an hour and a half or until tender, turning them over about halfway through the cooking. Tip off the fat. Mix the three sauces with the honey/brown sugar or maple syrup, garlic and ginger and spread some over the pork. Add the plums, stoned and cut into quarters. Return pan to the oven for about 15 minutes then remove, turn the pork over and spread with remaining sauce. 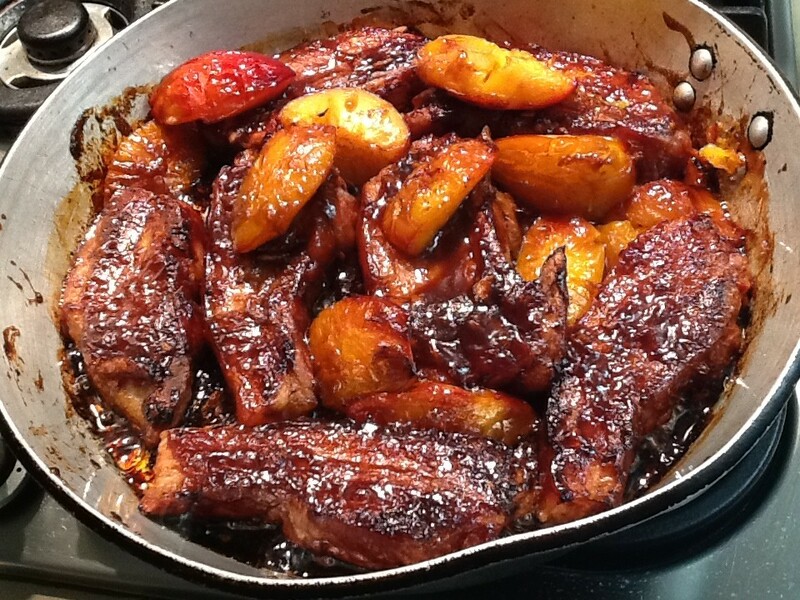 Continue to cook for a further 15 minutes or until nicely glazed and plums are cooked. Serve with steamed rice and steamed bok choy. Variations: leave out the plums altogether if preferred, or substitute peaches or nectarines. When we married, Matthew had been surviving as a bachelor for several years. The core of his culinary repertoire was contained in a small notebook with a green cover. It consisted of about 20 recipes, written out by his stepmother and sisters before he headed off to Geneva on his first posting, to make sure he didn’t starve. Pork Chops with Orange Sauce was one of the recipes in that book and it went on to become a firm family favourite as our kids were growing up. The original version just coated the chops in flour – I added the egg and crumb layer. Fiddling with recipes is, I have to admit, something of an affliction. I don’t make this dish very often these days, but when I do I am reminded that back in the days before Master Chef and the infinite number of recipes available on the internet, we didn’t eat too badly at all. This “retro” dish is simple, straightforward and delicious. Preheat oven to 180°C. Remove bones and excess fat from chops, then hammer them out a little bit with meat mallet. Coat in seasoned flour, shaking off the excess. Then coat in beaten egg, then breadcrumbs, pressing them on well. Heat butter and oil in a large frying pan and fry chops on both sides until golden. Place in an oven-proof dish in a single layer. Mix orange juice, rind, sugar and ginger and pour over. Can be prepared ahead to this stage and kept in the fridge, covered for several hours. Bake 45-60 mins uncovered at 180°C or until tender and browned. There should still be some sauce left, so if you check halfway and find it has mostly dried up, add few Tbs of water. As you can see in the photo my sauce had virtually disappeared! Serve with baked potatoes topped with a dollop of sour cream mixed with snipped chives or spring onion tops and a green vegetable. Scrub the potatoes and put them in the oven on the shelf below the pork. Large potatoes will take 15-20 minutes longer than the pork, so stick them in early. When we were growing up my sister Dee used to say she couldn’t eat pork which tasted “hairy”. I think I know what she meant. If you’re going to serve pork with the skin it has to be crunchy. There’s nothing attractive about soft pork fat and skin. Pork belly has become quite trendy in the last few years and there are lots of recipes on Google for different ways to cook it. Some are quite complicated, involving lots of ingredients. 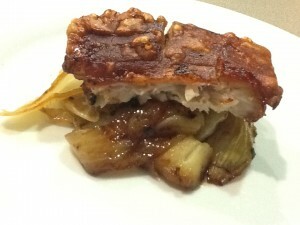 This is one of my favourite recipes for pork belly. It combines just two flavours with the pork – onion and apple – plus a few herbs. If the butcher hasn’t already done so, score pork skin all over in parallel cuts just under a centimeter apart, cutting through the skin only. Preheat oven to 160°C. Peel onions, cut into eighths and place in a roasting pan in the middle, like a nest. Rub pork all over with a little oil and season with salt and pepper. Press herbs into the meat side. Place pork skin side up on the onions and bake for about 2 hrs. During this time do not baste. If after an hour or so you think the onions are starting to burn, take them out and put the pork back. You want them to be caramelised, but not overly so. Meanwhile peel core and slice apples and place in a saucepan with water and sugar. Simmer for 10-15 mins until cooked. After 2 hrs, remove pork from oven and take it out of the pan. Tip off all the fat which can be kept and used for roasting potatoes. Turn oven up to 200°C. Mix onions with apples and place in the pan as before, like a nest, with pork on top. Bake for 30 mins or until skin is blistered and crunchy all over. Divide apples and onions between six plates. Cut pork into six neat squares or rectangles with a sharp heavy knife and place on top.